Not ready to commit? Try our limited-access, 30-day trial for FREE! Click here to register. No Agricultural/Farming insights provided w/this plan. Single User License only. Contact Us for site license plans. Own or manage more than 2 courses? We offer additional location tiers to fit your needs. Click the "Choose This Plan" button below to see more options. Read more about the C&S Grain Market Consulting Reports. *All paid plans come with an automatic renewal function. See our Terms of Service for more information. Our 11-month ahead forecasts for both temperature and precipitation allow you to be PROACTIVE rather than REACTIVE when it comes to the weather. A variety of tools including the Calendar tool, custom year-over-year Trending Charts, 25 Year Trend Charts, and Tables tool provide you with a range of ways to visualize the forecast for your location(s). Our long-range forecasting technique uses a proprietary formula based in statistics, historical weather, and 24 different climate cycles. Unlike short-range forecasts, our long-range forecasts will not change once they are published! Only once the date in question falls within the short-range window will you start to see a change. Offered in both Interactive and Static Regional, these mapping tools provide you with a 1-14 Day outlook across the globe for 37 different forecast and 8 current weather variables. 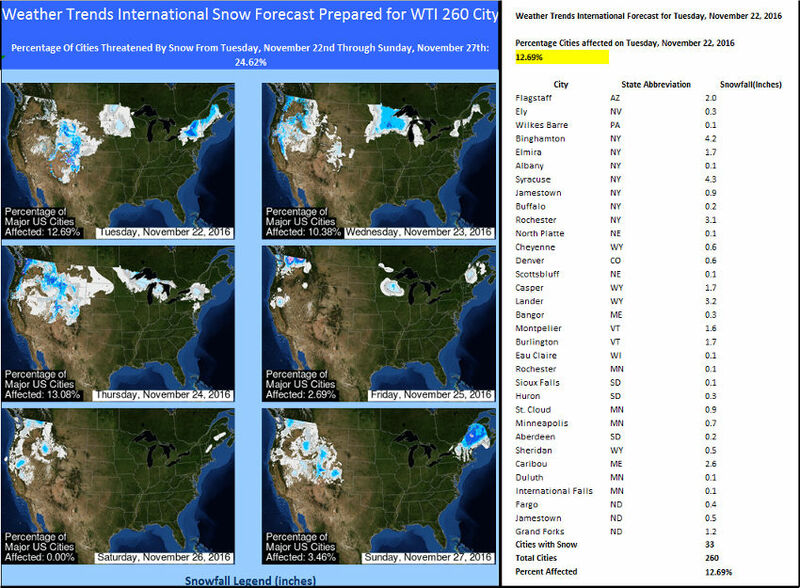 Delivered daily via email Oct - Mar, this report provides you with 1-14 day snow map outlooks for the U.S. as well as 1-7 day city-specific snowfall forecasts for 260 major cities across the country. You can turn on/off delivery of this report at any time via your Profile Settings. The wt360 hurricane and severe weather (thunderstorms/tornados) subscription provides a long range outlook where major weather events are likely to develop months in advance with in season alerting updates once systems develop. A detailed PDF report is sent upon selection of where hurricanes are most likely to develop and strike in the coming season. Do you know how weather impacts golf playable days or golf playable rounds at your location? Well now you can with wt360's customizable Historical Golf Rounds Played Analytical Tool. Using either the recommended thresholds or manually entering parameters you feel better suit your course (including temperature, precipitation, wind speed, round frequency, etc), you get a location-specific analysis of how weather has affected golfing at your course. If you want all your location-specific weather forecasts organized into a 4-page report that gets emailed to you every morning, then look no further than our FarmCast™. 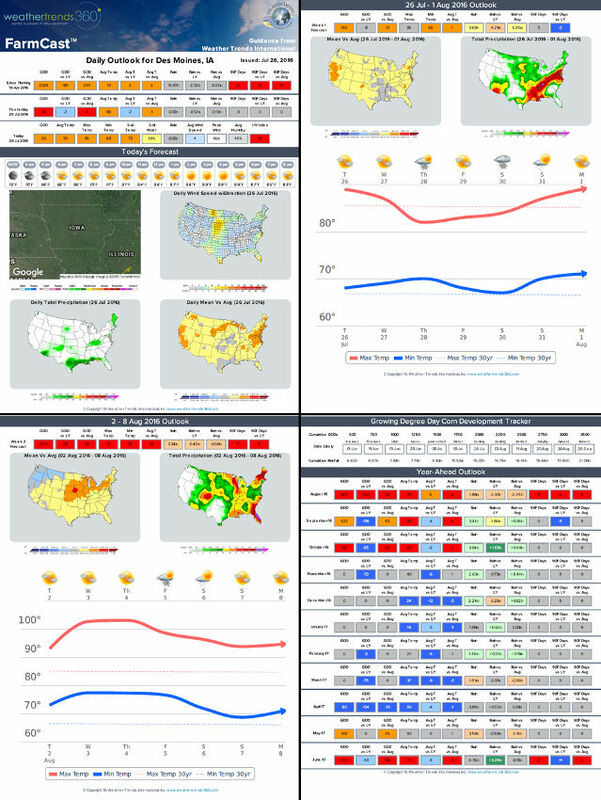 Based on user-set planting date and location, this report provides you with a season-to-date weather summary, today's detailed outlook, short-range AND long range YEAR-AHEAD weather forecast summaries, a Corn Development Tracker showing when important phases will occur based on our long range forecast, and more! FarmCast™ can also be accessed online within the weather portal. 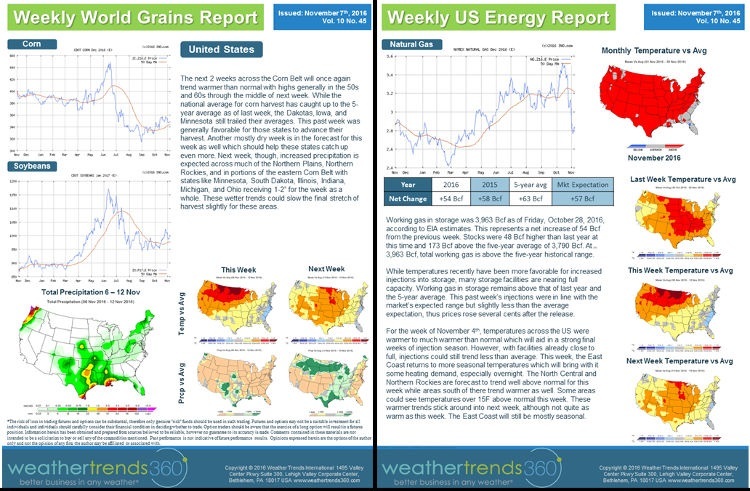 This grouping of reports focuses on short and longer range weather impacts on Grains and US Natural Gas. These reports are published once a week on Monday morning around 11:30am and will be available for download under the Energy/Ag section of the Reports tab.